Hello friends! 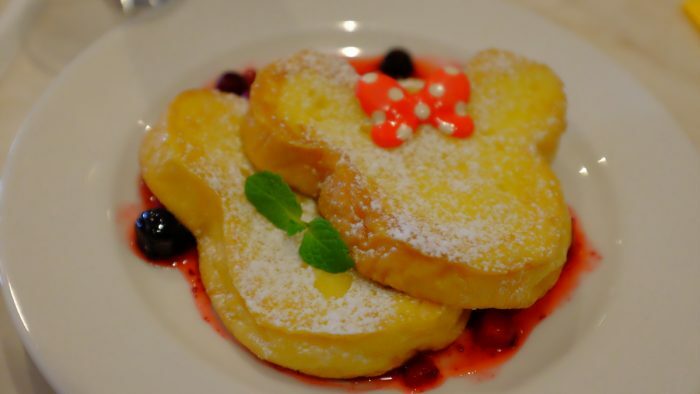 It doesn’t seem possible, but I just returned from another trip to Tokyo Disney Resort. 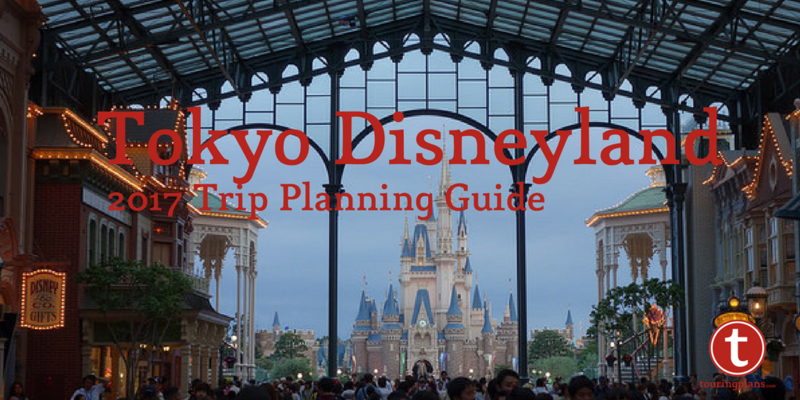 Many, many months ago I found a $700 round trip airfare from Orlando to Tokyo and even though my hubby couldn’t join me, I decided to book the trip. I’m so glad I did, because now I can share my Christmas experience with you. 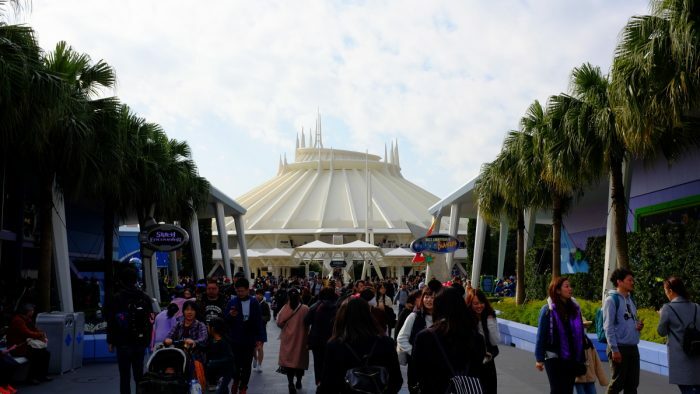 Let’s start with walking into Tokyo Disneyland. 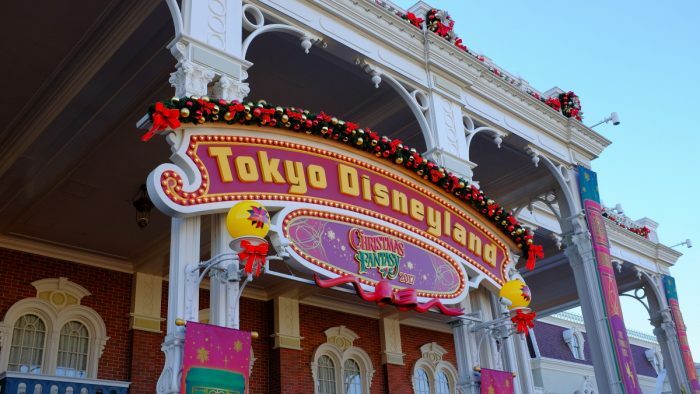 As many of you know, the Main Street section of Tokyo Disneyland is covered and the parade doesn’t come through this area. It’s an adjustment getting used to it, but I loved that the Christmas decorations could be placed lower without worrying about parade floats. Everywhere you looked was tinsel and wreaths. Tokyo really does things right! Now, if you’ve followed me for any length of time I bet you know what my first stop was on this trip. I was so excited that I ran past the castle, but turned around to take this shot. 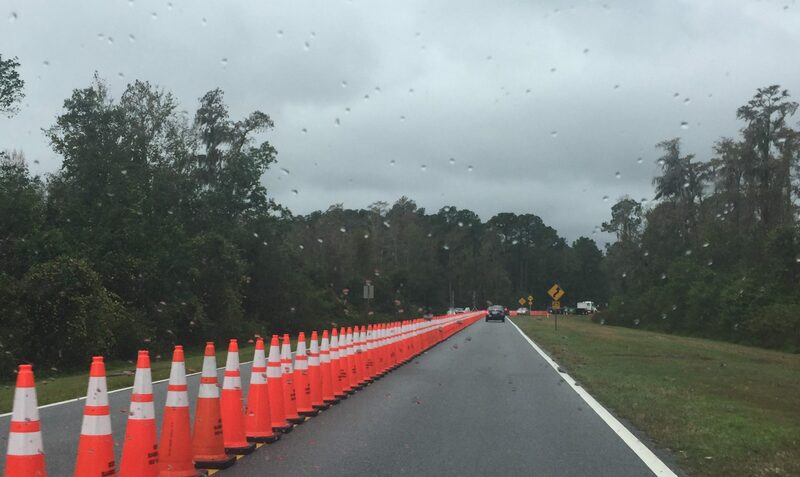 For a little bit you could almost think I was in the Magic Kingdom here in Florida. I’ve never seen such bright, blue skies in Tokyo! So did you guess where I was headed? 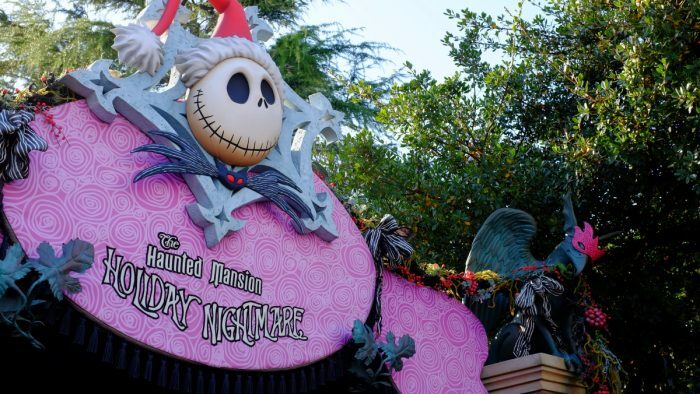 Haunted Mansion Holiday, of course! 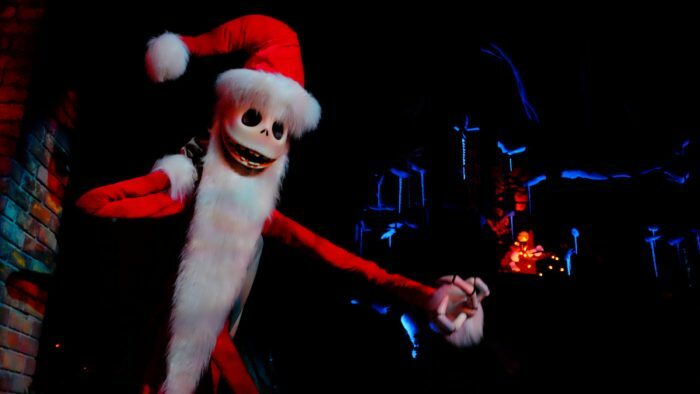 I’m a huge Nightmare Before Christmas fan and jump on this ride every chance I get. The Haunted Mansion in Tokyo is a carbon copy of the one here in Orlando, so it’s neat to see what it would look like if we were ever lucky enough to have this overlay. Forgive me for adding a couple of photos for this attraction. I was lucky enough to have my Doombuggy stop right in front of Jack–what a lucky break! I decided to take one camera and one lens for this trip so everything was shot at no lower than an f2 aperture. I was pretty delighted I was still able to get Haunted Mansion photos to share. 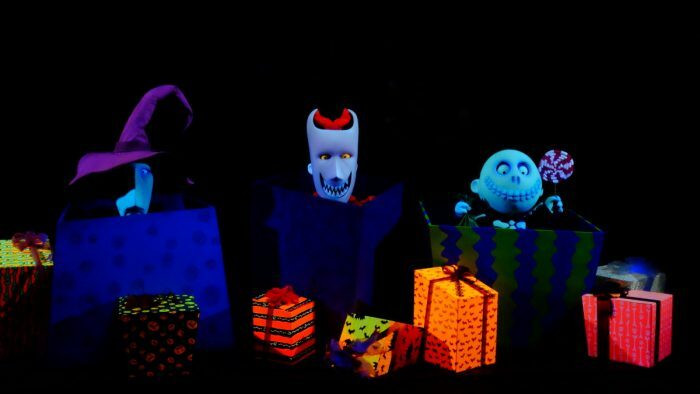 Just one more, the last scene here is of Lock, Shock, and Barrel rather than Oogie Boogie (like in California). 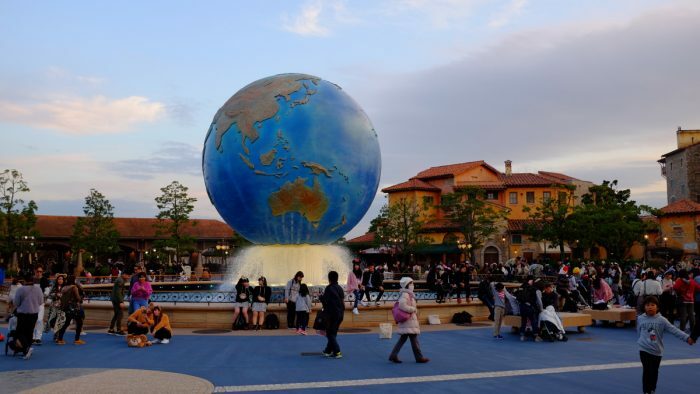 I love seeing the differences between parks around the world. I don’t think I’ll ever stop wishing that we would get this overlay at the Orlando parks. What do you think? 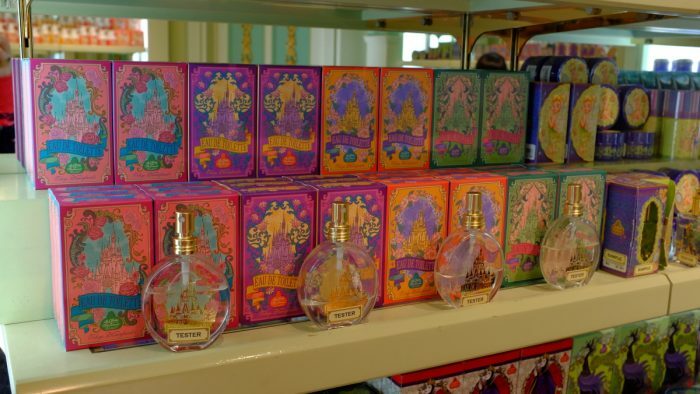 Are you a fan or do you prefer the classic Haunted Mansion? 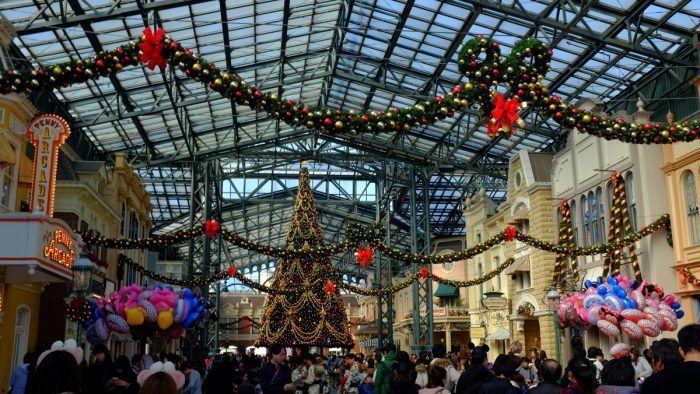 Check out the skies over Tokyo Disneyland. I’ve visited in September, April, and October but never had weather like this before. It was chilly with highs in the mid 50s to low 60s, but they sold plenty of cute merch to help you stay warm. If you’re trying to decide on a time to visit I think November is where it’s at! Something that I never get tired of eating are the Mike Melon Breads. 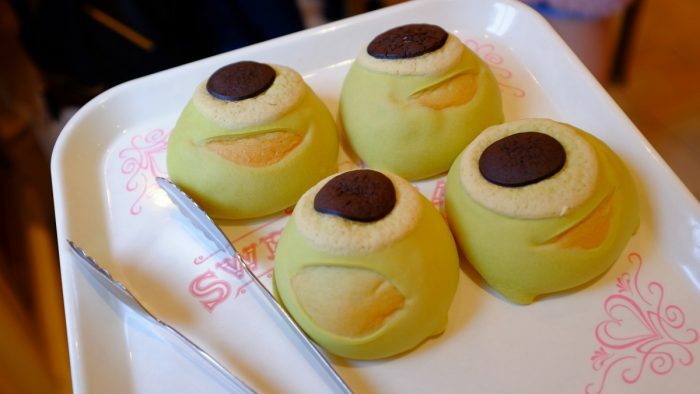 These are amazing, pillowy soft bread rolls flavored like honeydew melon. While I may have been guilty of eating one a day, I don’t want anyone thinking I put away four! These were lovingly packaged and carried 7,000+ miles home for my hubby. 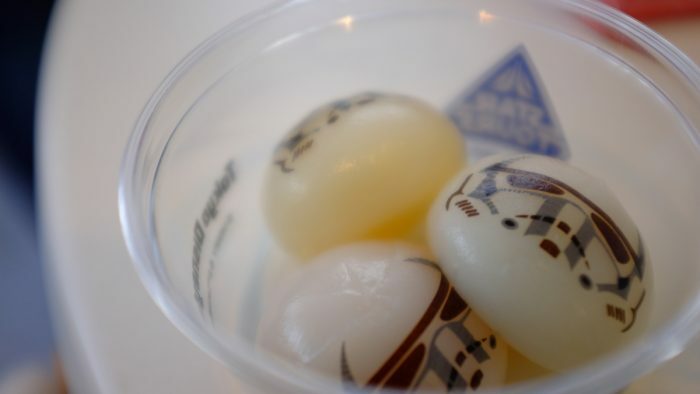 You know they must be good if they were the only souvenir he asked for! 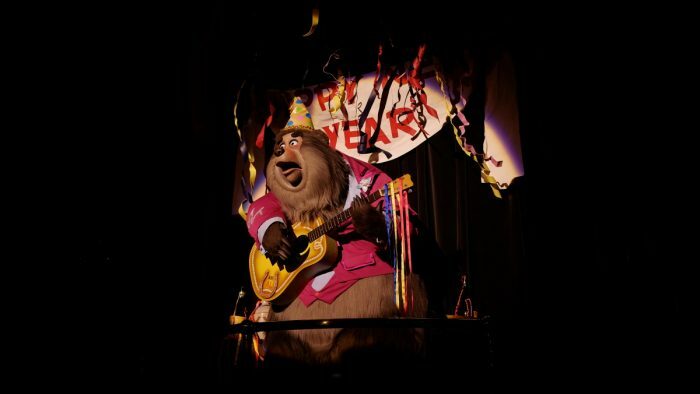 Something Tokyo still has that we don’t, is the Country Bear Christmas Jamboree. 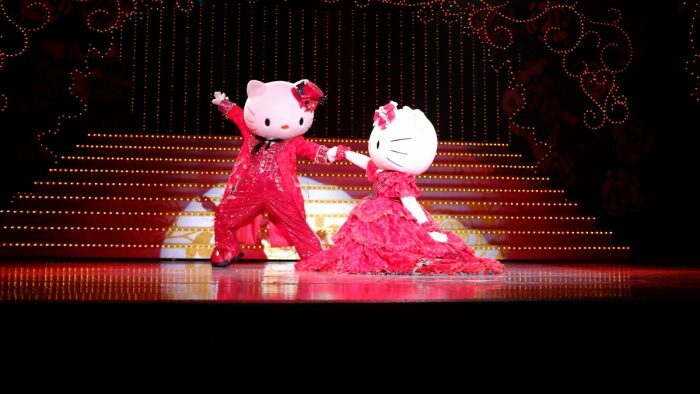 I was thrilled to see it again, even if half of it was in Japanese. 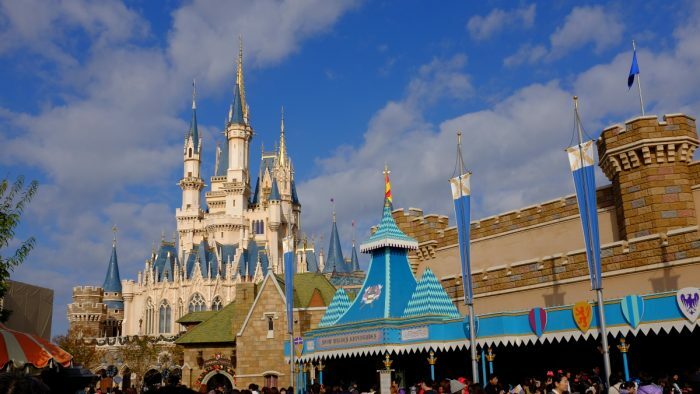 I wish we still had the seasonal specials at the Magic Kingdom, but I suppose I should be happy they haven’t shut the show down altogether. Big Al celebrating the New Year is just too epic for words! 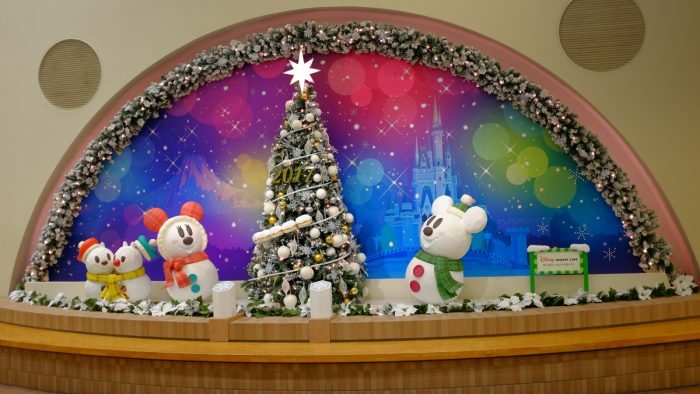 The mascot for Tokyo Disney Christmas is the Snow Snow. 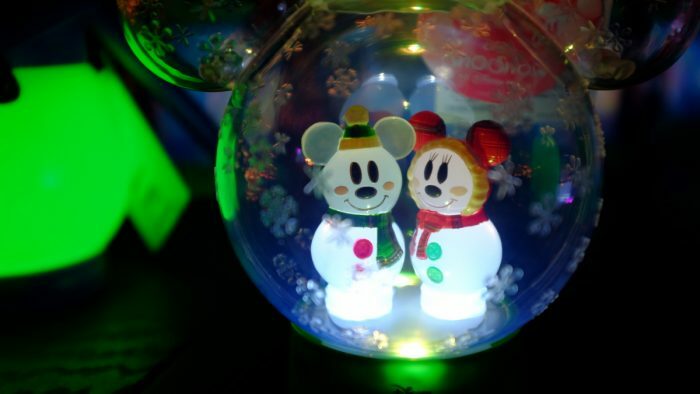 These are adorable little snowmen shaped like Mickey, Minnie, Chip, and Dale. These cuties were on all the merchandise and you could create your own little stuffed one. (I chose Minnie.) I kept trying to think of a practical reason to bring this lantern home. I never did come up with a good excuse though! 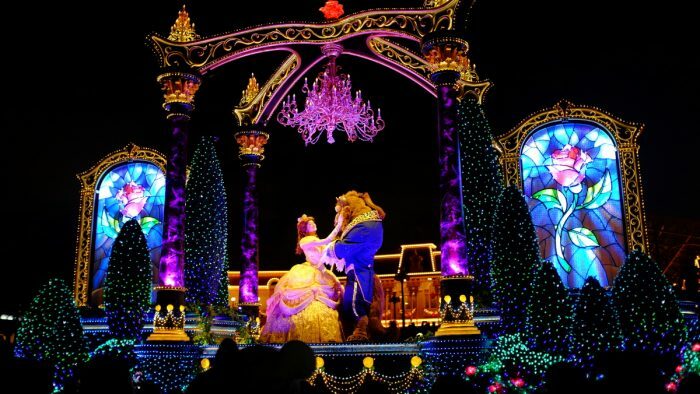 While Paint the Night is still the best parade I’ve ever seen, Dreamlights is a pretty close second. It was already amazing, but was recently expanded to include new floats. The prettiest one was this Beauty and the Beast addition. I’m hopeful that the Magic Kingdom will be getting a new evening parade soon that will be half as good as this one! When switching parks on the monorail there is even more cute! Check out this Snow Snow display that could be found at the station. When people placed their hands on the snowflakes at the base of the tree the entire tree would light up and the “2017” would illuminate. What a cool touch! 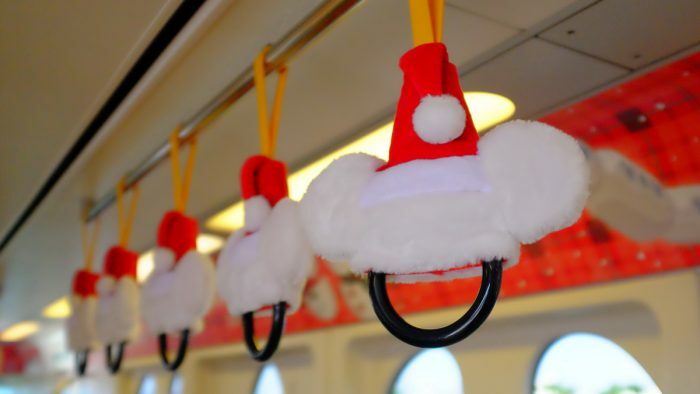 Of course, the monorails were also dressed up for the season. Just so I don’t only tell the good things, my friend told me I was lucky to be visiting early in the season because later the white fur would be stained and dirty. Of course, I don’t think they would have lasted long in another park as they were only held on with velcro. 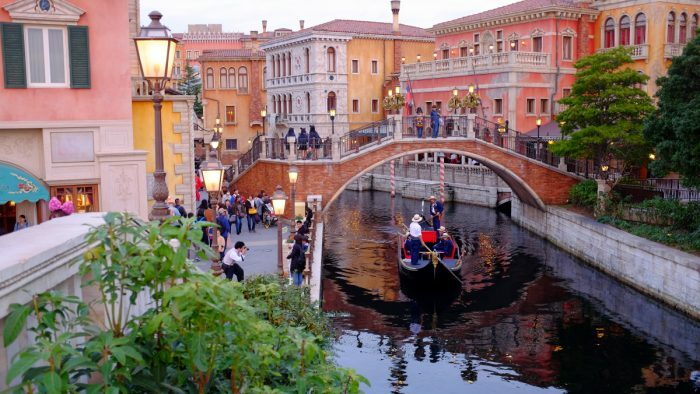 The one thing that I had never done in all my trips was the Gondolas. This ride closes whenever something is happening on the harbor so it’s tough to figure out when they’re actually going to be open. That paired with the fact that there is an awesome ice cream shop nearby meant that we just kept missing it. I was determined to ride this trip no matter what! And I was rewarded with this amazing view. Can you believe they actually take free floating gondolas around this lagoon? 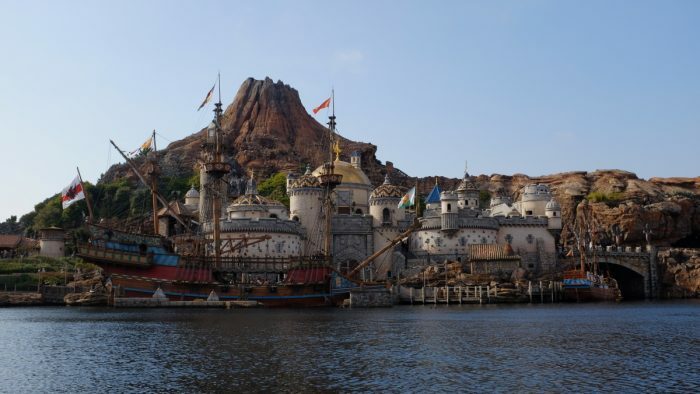 It would be like offering rides through the World Showcase lagoon. I’m amazed that more people don’t end up in the water or doing other stupid things. But then, the Japanese people seem pretty amazing. Check out this adorable little kid dressed like Shellie May. Since it was colder, I saw many kids dressed in these amazing outfits that are not sold in the parks. I can’t imagine how much work it would be to make one of these, but the kids were too cute for words. 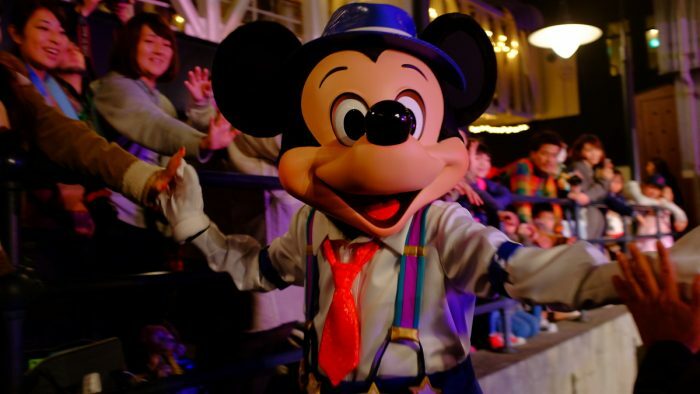 Check out Mickey Mouse getting treated like a rock star. (Rightfully so!) I wonder if the addition of a big theater in the Magic Kingdom will mean Mickey will get to star in something back home? What are you hoping for in that new theater? 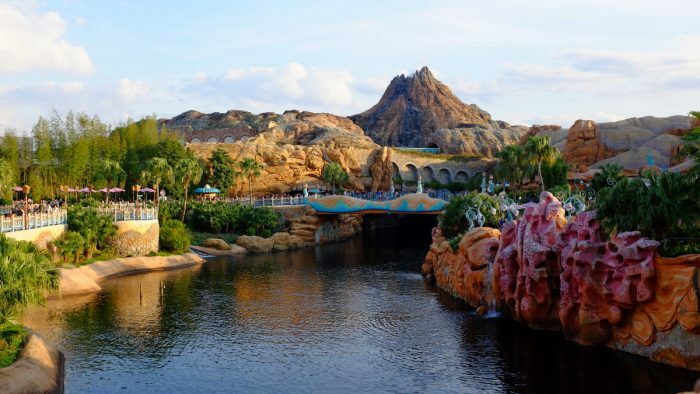 More than anything, the views around Tokyo DisneySea are just fantastic. A friend pointed out to me that the volcano changes in appearance as you walk around the park to fit with each land. It happens so seamlessly that I hadn’t even noticed. Mermaid Lagoon was decked out for the holidays. I was impressed with how they used coral and starfish to decorate along with the theme. This area is always so pretty, so it isn’t surprising that they pulled out all the stops for Christmas. 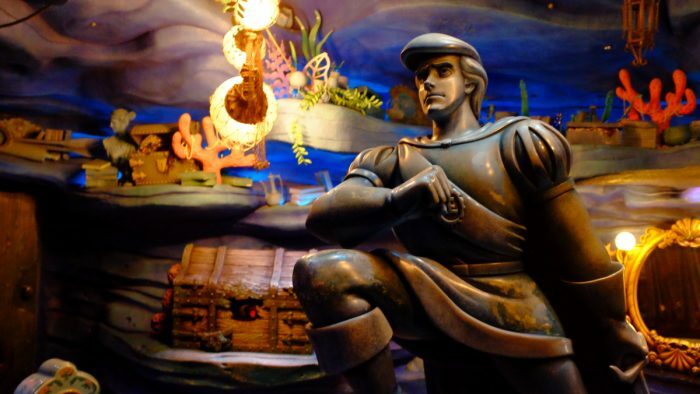 This doesn’t have anything to do with Christmas, but it’s the first time I’ve ever actually found the Eric statue in Mermaid Lagoon. It was worth waiting to get a shot of him. What a cool, little gem hidden in this crazy park! Remember that volcano that changes around the park? 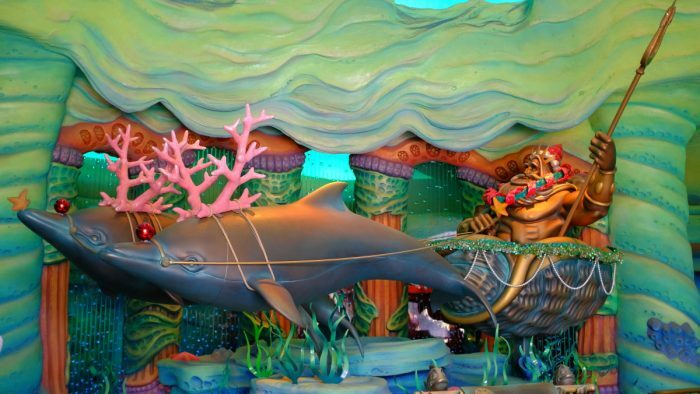 This is what it looks like in Port Discovery, the new home of Nemo and Friends SeaRider. While the ride was entirely in Japanese it was still easy to pick up on what was happening and I’m glad I gave it a try. It’s a nice addition to the park and different than any of the Nemo attractions we have in the states. The lagoons around SeaRider had the Nemo and Friends characters. 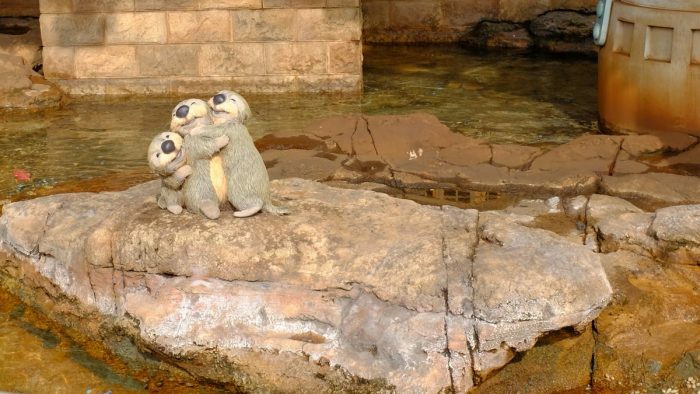 The cutest one was the otters having a cuddle party! I don’t want to spoil anything, but that is one of the scenes from the ride that I was lucky enough to get the first time. I say I was lucky because once I found out the otters were an option I would have ridden over and over until I got to see them! That’s it for this time. Thanks for joining me for another week of fun! Please let me know if you have requests for next time around. Until then – I hope you’re having the best week ever. 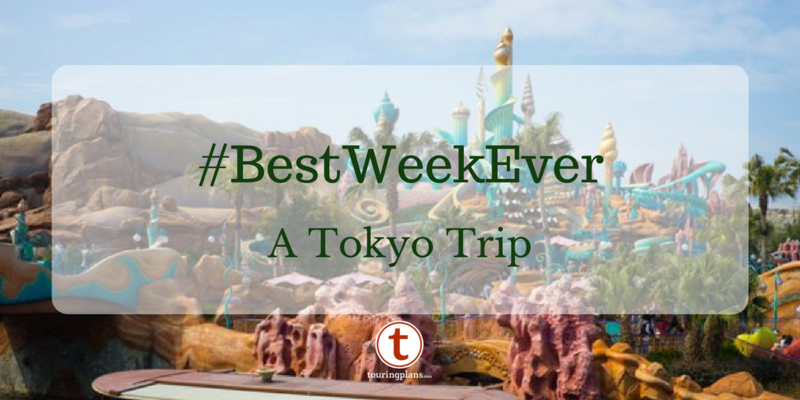 Julia’s Best Week Ever, January 12, 2017: Best (Week) Plans? Thanks for sharing Daisy. Looks like a blast! 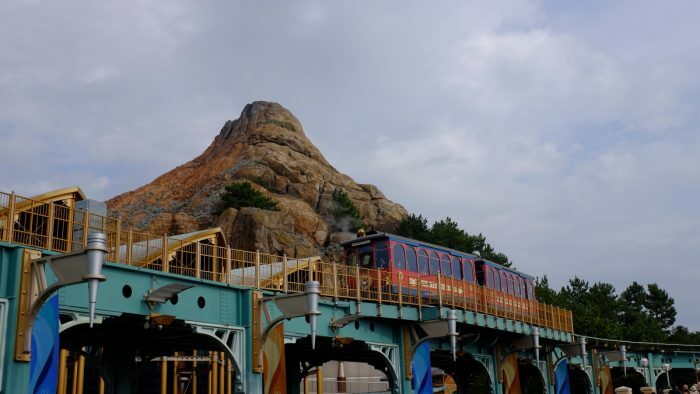 What would you say is the most unique thing about Tokyo Disneyland? There are so many things that are different, but if I had to pick one it would be the people. They are so organized and follow rules to a fault. Imagine being able to set down a mat for your parade spot and walk away with no worry that it would be there when you return. (People even leave purses, wallets, etc.) At parade time everyone in the first few rows sit down so others have a better view! There is no shoving in at the last minute or having others pushed up against you. Imagine NEVER seeing a flash photo on a ride. Honestly, it’s mind blowing. There are lots of other things to like, but that would be my #1.